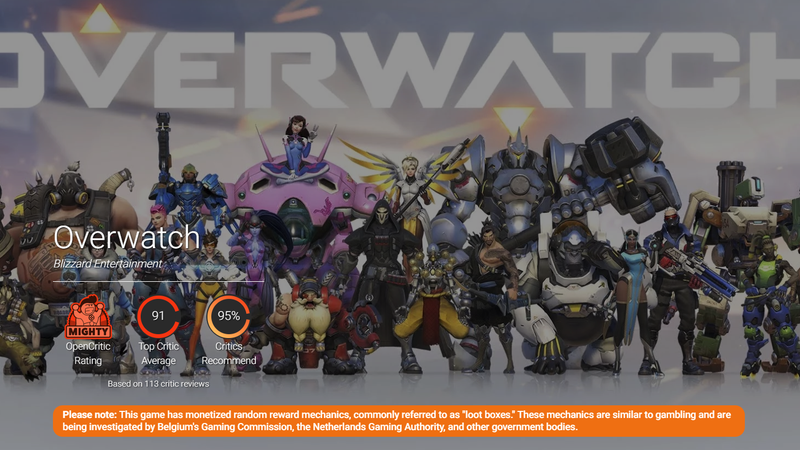 On Overwatch’s OpenCritic page, for example, there’s now a bolded section highlighted in orange right below the aggregated scores that reads: “Please note: This game has monetized random reward mechanics, commonly referred to as ‘loot boxes.’” It goes on, calling loot boxes similar to gambling and pointing out that they are being investigated by regulatory agencies in Belgium and the Netherlands. The site tweeted in October 2017 that it planned to “take a stand against loot boxes,” back around the time the issue of monetized gambling in games was being widely debated following the release of games like Middle-earth: Shadow of War and NBA2K18. The release of Star Wars: Battlefront II a month later pushed the topic into a national spotlight, leading some state and Congressional legislators to weigh in on the issue. In the year since, Belgium’s government has forced the removal of loot boxes from games including FIFA 19 and Overwatch in its country, while many games that still have them in the United States now disclose their odds. Notably, the OpenCritic pages for Battlefront II and Shadow of War do not include the new warnings since loot boxes were eventually removed from both games following the public backlash against them. Correction: an earlier version of this article listed Fortnite as being one of the game flagged by OpenCritic for loot boxes. It is not.